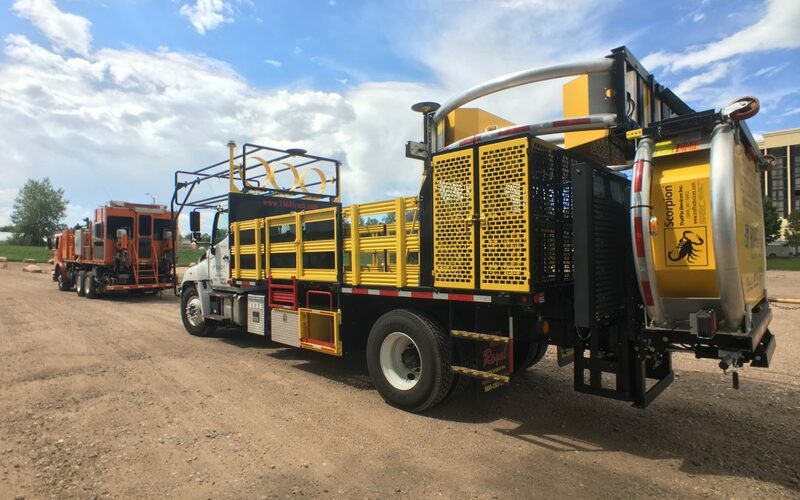 ARTBA member Royal Truck & Equipment unveiled its autonomous impact protection vehicle, or AIPV, during an Aug. 18 demonstration of a striping operation in Fort Collins, Colorado. “Our initiative is to help save lives in work zones and we believe this technology will help do just that,” Royal Truck President Robert Roy said at a press conference. He said a Louisiana work zone truck driver’s death prompted him to create the AIPV, which the company says is the world’s first deployment of a driverless work zone vehicle. Shailen Bhatt, executive director of the Colorado Department of Transportation (CDOT), said motorists struck a CDOT impact protection vehicle 26 times during the last four years. Martin Knopp, associate administrator of operations with the U.S. Federal Highway Administration, said a crash occurs every 5.4 minutes in a U.S. work zone, resulting in 12 fatalities per week. Both agency officials agreed the AIPV will help protect workers. Watch a video of the Royal Truck demonstration.